Rainbow Theatre, Northumberland Mall, Cobourg. 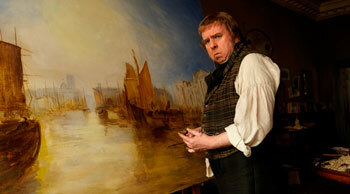 About Mr. Turner. Much like the storied works of its titular character, Mr. Turner is a chaotic and beautiful look inside the life of landscape artist, J.M.W. Turner. Set in the twilight years of the painter's life, Mr. Turner opens with an already-successful artist seeking to rejuvenate his passion for the craft, and continue to expand upon his portfolio. A solitary man, Turner (Timothy Spall) is looked after by his live-in housekeeper (Dorothy Atkinson), and father, William (Paul Jesson). Accepted by his peers, and held in high esteem by the aristocracy, Turner is free to travel across Great Britain painting landscapes, and selling his art. With only his sketchbook as his constant companion, Turner crosses the countryside searching for inspiration for his works.